Jesus said, "My Father's house has many rooms; if that were not so, would I have told you that I am going there to prepare a place for you?" (John 14:2). With a fresh point of view on the destination of believers, Heaven reminds you of the glories that await you in your forever home with God. 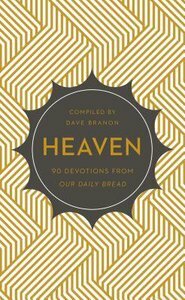 Written by Our Daily Bread contributors, this collection of inspiring meditations encourages you to think about "things above." Through Scripture passages, compelling stories, and quotes from notable Christians, you'll find a spiritual compass to keep you focused. Get a glimpse of heaven in the pages of this devotional book-and discover a confident hope in knowing you're headed toward a never-ending place of perfect peace. About "Heaven (Our Daily Bread Devotional Series)"